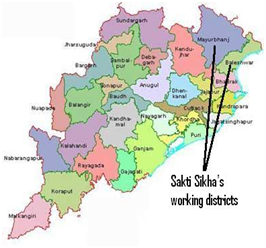 Sakti Sikha is presently working in Mayurbhanj & Balasore district of Orissa in India. The Organisation is having its Administrative Head Office At- Baripada (the district head quarters of Mayurbhanj), a project office at Jharpokharia, Mayurbhanj, and the district coordinating office at Langaleswar, Balasore. Alliance for Women & Rural Development (AWARD)- Leader Organisation. We are a civil society organisation always follow the voluntary code of ethics. Integrity, Intellectual Prosperity & Professionalism are the main resources of the organisation. We always maintain accountability and transparency in all our inside and out side work.